Every so often and on that rare occassion, a ticketing agent will offer a free upgrade. 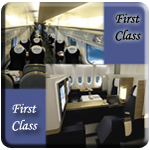 However, IFlyBusiness will help you get First Class upgrades at cut-rate prices even if you are flying last minute! The opportunity to travel inFirst Class has its own rewards - comfortable seating with ample room to stretch, more private cabin space, easy baggage check-in at first class counters, and exclusive lounge access. Some airlines even offer Limousine service to only their First Class passengers. Here are ;some of the way we can help get you that discounted First Class ticket so you may experience the airlines highest class of service.